Many years ago a friend introduced me to an audience as "The Doctor With The Star Studded Classrooms". I guess I had that coming as I have been very blessed to have been helped by so many wonderful people in my teaching. Most of them have been film and T.V. stars. I am a retired history and government teacher and am now very involved in the entertainment media, writing, travel and grandchildren. I am married to the former Carolyn Harr of Grundy, Virginia, now a retired kindergarten teacher. We have two children, Carol Webster (married to Buddy) a drama teacher and Fred II (married to Mary Kay) a Christian missionary who is now back in this country working with college international students. We have five grandchildren, William Webster, Anne Marie Eichelman, Josiah David Eichelman, Michael Fredric Patrick Webster, and Fredric Charles Eichelman. I began my life in Cleveland, Ohio and developed an early love for reading, writing, history, films and the Cleveland Indians. Later I became a letter writer and autograph collector which put me in contact with a number of people both in politics and film. My secondary education was at the Shenandoah Valley Academy in New Market, Virginia where my family moved when I was ten. After over sixty years I have deep ties with that school. Then it was Bridgewater College, the University of Virginia, University of Florida-South, and I received my doctors from Virginia Tech and State University. Carolyn began her life in Grundy, Virginia, had her secondary education at Grundy High School and then went onto Radford University. After work at the University of Virginia she went on to earn a Masters plus at Virginia Tech and State University. The process of learning continues for both of us and we still see ourselves as students. My years since graduation from Bridgewater in 1957 have been spent in the Roanoke Valley of Virginia, mainly in Salem. During my teaching career I taught on both elementary and high school levels, was a principal, director of federal programs and a curriculum author. I also was president of my local education association, served as president for two terms of a state social studies teacher organization, edited a teacher newspaper and was appointed by three governors of Virginia to serve on three state boards. Carolyn taught first in Roanoke City, was one of the first teachers in the War on Poverty Head Start program, and then taught the rest of her career in Roanoke County. Her area has been the primary grades with most of her work concentrating on kindergarten. She had the distinction of authoring the first kindergarten curriculum book for the state of Virginia. In the city of Salem in 1972 she was selected as the city's most outstanding young educator by the Salem Jaycees and was second runner up for outstanding young educator in the state of Virginia. Both she and I have trained a combined number of 50 student teachers. She was also active in Jaycettes, the Roanoke County Education Association and one of the founders of the Roanoke Valley Entomology Club. She has partnered with me in all my activities. 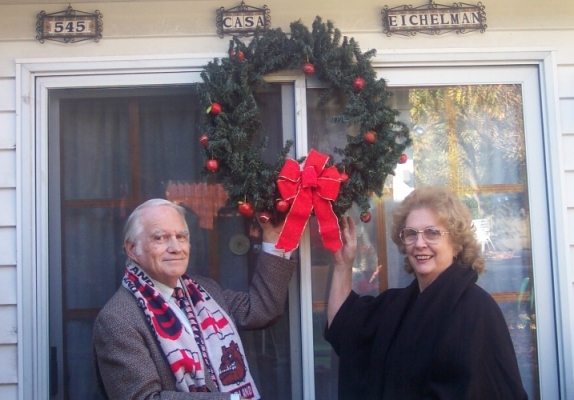 In our early years I was an Episcopalian and Carolyn was in the Church of Christ. We were married in the Presbyterian Church and remained in that denomination until 1976 when we became Southern Baptists. Dr. Charles Fuller was our in spiration for that. We have both been Sunday School teachers. What marked my teaching was what became known as my "star studded classrooms". I used films and T.V. series in my teaching and through autograph collecting I made contact with media folks and authors who were interested in my work. Many became personal friends of Carolyn and mine. Among those I especially am thankful for are Forry Ackerman, Kay Aldridge, Richard Biggs, Nelson Bond, Leigh Brackett, Ray Bradbury, Lynda Carter, Hal Clement, Bing Crosby, Gregory Crosby, Spice Williams-Crosby, Rhonda Fleming, John E. Gardner, Kathy Garver, Jane Greer, Connie Haines, Linda Harrison, Susan Hayward, Bob Hope, Stephen Lawhead, BarBara Luna, Deanna Lund, Beverly and Jack McDermott, Caroline Munro, Angelique Pettyjohn, Fred Pohl, Ronald Reagan, Roy & Dale Evans Rogers, Jane Russell, Tom Selleck, Jimmy Stewart, Elizabeth Taylor, William Tenn, John Wayne and Grace Lee Whitney. So far I have written five books, three of them textbooks and one a co-authored novel. Most recently I wrote, having Carolyn as chief advisor, Faith, Family, Film A Teacher's Trek. This is both a memoir and a history of the entertainment world covering 100 years. For a while Carolyn and I also worked within Republican Party ranks. I was a local chairman, ran numerous campaigns and we had the opportunity to meet with and work with Richard Nixon, Ronald Reagan, and U.S. Senator John Warner. Carolyn served as hostess for many political gatherings in our home. I took early retirement in 1991 and Carolyn joined me in 1998. We had a dream come true with our first trip to England and returned several times. Also we were in Spain to visit our missionary family several times when they were there, as well as Italy, France and Jamaica. For thirty years we were involved in creating and running media conventions first known as RoVaCon, then Rising Star, and STARZ 2000 and finally a Christian Media Convention, Point North Outreach. Many of our friends mentioned above have been a major help as participants and in securing other guests. Carolyn's Guest/Staff parties have been called legendary. Carolyn and I also ran a support group for a close actress pal Deanna Lund who starred as Valerie Scott in Land of the Giants. We named it The Friends of Deanna Lund and its primary charity was Victory Over Violence No More. It was through Deanna that I was able to co-write with her my first novel, Valerie in Giantland. After a ten year break Carolyn and I ran a reunion event based on friends and events who took part in those thirty years. It was titled Media Event Reunion. Out of that came another event we are now involved in titled Happy Trails Virginia Style. Carolyn and I are presently compiling albums with a mega collection of pictures, documentation, and commentary for a 200 year family history. I am also editing a Christian media magazine which was an outgrowth of our Christian media conventions. It is titled Point North Outreach Newsletter. We have been able to feature inspirational articles involving Christians who have been or who are now connected with films, TV and the world of music. Very instrumental in this has been Rhonda Fleming whose work was the first that I used in the classroom as a teacher. We are involved with our drama teaching daughter, Carol Webster's work with the William Byrd Players and the Center for the Performing Arts, both in the Roanoke Valley. Also with our son Fred and family, who like Carol and family, lives here in the Roanoke Valley where they work with international students at Virginia Tech. I have nearly died three times in my life and feel it is a miracle to be alive. I can definitely point to a miracle filled life and feel very blessed by God. Especially to have Carolyn. I am a Christian and though I have met many celebrities in my lifetime, counting some as dear friends, it is Jesus Christ who is my best friend. Carolyn shares this with me and we look forward to the great adventure we have ahead of us, both in this world and the next. For this world, there's still a lot to do and a great deal we both still hope to learn. If you share any of my above interests I would like to hear from you. I want to thank Carolyn for her love and encouragement to do this.